If you’re looking for timeless elegance wrapped up in one vehicle, the Audi A8 hire car is for you. Upon your chauffeur hire, we’ll ensure that your vehicle is cleaned and detailed so that you never have to worry about the quality or condition of your rental. This stunning vehicle can hold up to four people (not including your chauffeur) and three medium pieces of luggage with ease, which means you’ll never have to sacrifice what you pack. However, just because you fill the vehicle to maximum capacity doesn’t mean you won’t have space to breathe. The Audi A8 hire car has roomy interior guarantees that all passengers, whether riding as the front passenger or in the backseat, have room to relax without feeling cramped. The unrivaled interior space makes for a great choice when you know you’ll be taking extended drives. This vehicle is sophisticated from the inside out and you’ll love all of its luxury features. From its sleek headlights to its comfortable, relaxed interior, you’ll be extremely satisfied with this chauffeur option. The sporty design allows for agile handling on any road, and its multiple safety features ensure that you can get where you’re going worry-free. The all-wheel steering provides extra power in any condition, and its efficient engine works to your advantage. 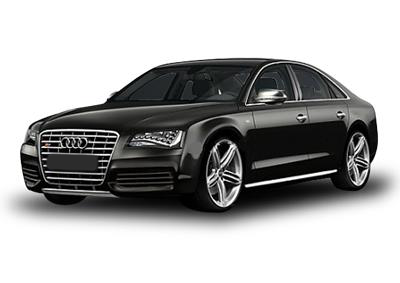 Let our Audi chauffeurs get you from A to B with our Audi A8 hire car services today.